A Muslim imam behind a proposed cultural center two blocks from New York's Ground Zero said he must build there despite angry protests in order to defend America and its citizens against a "danger from the radicals in the Muslim world to our national security." If he could start over, Imam Feisal Abdul Rauf said, he would propose a different site for his project. "If I knew this would happen, that this would cause this kind of pain, I wouldn't have done it," Rauf, 61, said in an interview with CNN's Soledad O'Brien on "Larry King Live" Wednesday evening. "My life has been dedicated to peacemaking." But, capping a day-long rhetorical offensive that began Wednesday morning with an opinion piece in The New York Times, Rauf said he intends to go ahead with the "multifaith" center near the site where Islamic terrorists killed nearly 2,800 people because not doing so would unleash fury abroad. "If we move from that location, the story will be that the radicals have taken over the discourse," Rauf told CNN. "The headlines in the Muslim world will be that Islam is under attack. "There is a certain anger here [in America], no doubt," he said later in the interview. "But if we don't do this right, anger will explode in the Muslim world. If we don't do things correctly, this crisis could become much bigger than the Danish cartoon crisis [over images depicting the Prophet Mohammed], which resulted in attacks on Danish embassies in various parts of the Muslim world. And we have a much bigger footprint in the Muslim world." 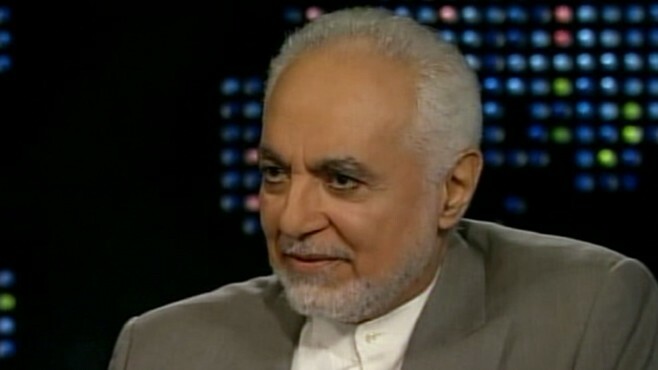 For similar reasons, Rauf voiced displeasure on CNN with Florida Pastor Terry Jones's plan to burn Korans on 9/11 -- though he said today he was not planning to move his cultural center in exchange for Jones calling off his event. "I am glad that Pastor Jones has decided not to burn any Korans," Rauf said in a statement read to ABC News' Christiane Amanpour. "However, I have not spoken with Pastor Jones or Imam Musri [a Florida imam purported to have acted as a go-between]. I am surprised by their announcement. We are not going to toy with our religion or any other. Nor are we here to barter. We are here to extend our hand to build peace and harmony." Rauf will appear on "This Week With Christiane Amanpour" this Sunday. Check your local listings for airtime in your area. Until Jones announced the event was being cancelled today, the Gainesville, Fla., pastor vowed to go ahead with "International Burn a Koran Day" despite widespread pleas to scrap the idea on the grounds that it would put U.S. troops abroad in danger. "In the Muslim world, it is already creating a lot of disturbance," Rauf told Amanpour in the interview to air Sunday. "That is exactly what I mean by the radicals dictating the agenda. And Gen. [David] Petraeus [commander of U.S. forces in Afghanistan] and many people have pointed out that this type of action [is what] the radicals in each side feed upon." On CNN Wednesday, Rauf said, "We have freedom of speech, but with freedom comes responsibility. ... This is dangerous for our national security, but also it is the un-Christian thing to do." Earlier however, House Minority Leader John Boehner, R-Ohio, made a similar argument against Rauf's community center, denouncing it in the same breath as Jones' Koran-burning plan. "To Pastor Jones and those who want to build a mosque," Boehner said, "just because you have a right to do something in America, does not mean it is the right thing to do." Rauf told Amanpour that burning Korans and building his center near Ground Zero are nothing alike. "You can't equate the two," he said. "This is now the moment between the radicals and the moderates. We are to look at it from the point of view of those who are trying to create a breakthrough for moderation against those who are trying to create a breakthrough for the radical voices. How can you equate burning of any person's scripture with an attempt to build interfaith dialogue? This is a house with multifaith stakeholders, with multifaith partners intended to work together towards building peace." In his Times op-ed article, Rauf argued that, despite comments from critics such as Boehner, building the project that he described Wednesday as an interfaith center called Cordoba House is the right thing to do. "Our initiative is intended to cultivate understanding among all religions and cultures," he wrote. "Our broader mission -- to strengthen relations between the Western and Muslim worlds and to help counter radical ideology -- lies not in skirting the margins of issues that have polarized relations within the Muslim world and between non-Muslims and Muslims. It lies in confronting them as a joint multifaith, multinational effort. "From the political conflicts between Israelis and Palestinians to the building of a community center in Lower Manhattan, Muslims and members of all faiths must work together if we are ever going to succeed in fostering understanding and peace," he wrote. However, plans for the "Ground Zero mosque," approved by the city of New York, have stirred opposition from critics who claim that it is insensitive to build what until recently had been presented as an Islamic center so close to what many consider hallowed ground attacked by Islamic extremists. Opponents have ranged from the Anti-Defamation League to conservative politicians like Sarah Palin and Newt Gingrich. New York Gov. David Paterson, a Democrat, was rebuffed when he offered to help Rauf find another site. A late-August poll by Quinnipiac University found that 71 percent of New Yorkers want the center moved and want state Attorney General Andrew Cuomo to investigate funding for its construction. Rauf, a long-time imam at a mosque a dozen blocks from Ground Zero, said he didn't make his arguments earlier because he wanted to be on American soil before he spoke. He had been on a State Department-sponsored goodwill tour of the Middle East until recently. "I'm proud to be American," Rauf told ABC News on Aug. 31, just before returning home. "America is where I found my faith." The imam told ABC News that the battle over the project "has expanded beyond a piece of real estate and expanded to Islam in America and what it means for America." On CNN, as he has done previously, Rauf suggested that conservative politicians were using the issue to stoke support in the months before the November elections. "This story first broke last December in the New York Times and nobody objected," he told CNN. "This controversy only began in May. And it began as a result of some politicians who decided to use this for certain political purposes." Rauf suggested to ABC News that he sees building the mosque as a battle "against radicalism in all its guises," and continued to argue Wednesday that it is a fight for the American way. "The reason America is successful is because of its diversity, because of its immigrants," he told ABC News. "Multi-culturalism is a fundamental." He told CNN that the battle is not between Muslims and non-Muslims. "The real battle front is between moderates on all sides, of all the faith traditions, and the radicals on all sides," he said. But even in Dubai, where he spoke to ABC News on Aug. 31, at least one Muslim wondered whether Rauf had selected the right site for his cultural center. Mishaal Al Gergawi, a prominent local writer and analyst said, "Maybe it's just creating another battle. Maybe it's too early. Maybe it should come in five years. I'm really on the fence." ABC News' T.J. Winick contributed to this report.